The artworks for this exhibition explore a collective need to get higher, get lost, reach a higher place, and be transformed. The imagery in these drawings brings together a collection of utopian fetishes; objects and figures perched, often precariously, atop high places and craggy peaks. Through tiny glimpses of early American history and the so-called Age of Aquarius, the drawings also create warm but cautious vignettes of utopianism and escapism. 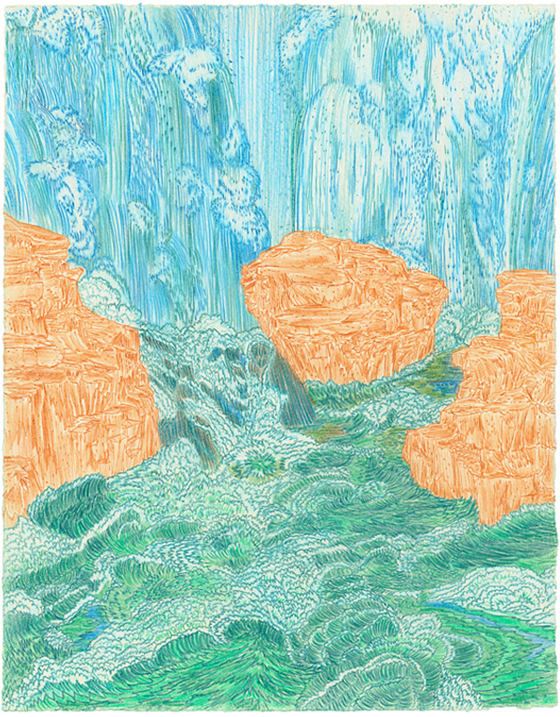 Feelings of isolation, loneliness and abandonment permeate the drawings, contrasted by colorful elation and a sense of purpose through elevation. Michael Krueger was born on January 5, 1967 in Kenosha Wisconsin. His family moved to South Dakota in 1970 and he spent his childhood years in Sioux Falls. These formative years in the West cultivated a fondness and curiosity for the history of Westward Expansion and the epic struggles that were cast on the Great Plains. In 1990 Michael earned a BFA from the University of South Dakota and in 1993 he graduated with an MFA from the University of Notre Dame. In 1995, Michael moved to Lawrence, Kansas for a teaching post at the University of Kansas. Michael’s creative research has taken him all over the globe from Asuncion, Paraguay to the United Arab Emeritus, to Scotland, England, Belgium, France and Italy. He has given over 100 lectures and workshops at venues such as Cranbrook Academy of Art, RISD, City College of New York, Edinburgh College of Art and the School of the Museum of Fine Arts Boston, Boston, MA. He has recently had solo shows at Sunday L.E.S., New York, NY, Steven Zevitas Gallery, Boston, MA, Packer/Schopf Gallery, Chicago, IL, Bennington College, Bennington, VT and Vanderbilt University, Nashville, TN. Recent group exhibitions include, KRETS Gallery, Malmo, Sweden, Baer Ridgeway, SanFrancisco, CA, Ambacher Contemporary, Munich, Germany, Glasgow Print Studio, Scotland, UK, Adam Baumgold, New York, NY and the Kala Art Institute, Berkeley, CA. Bookmaking workshop with Rebecca Blocksome – Saturday, March 12, 2-4 p.m.
Multimedia workshop with Jennifer & Brandon Larsen – Saturday, March 19, 2-4 p.m. 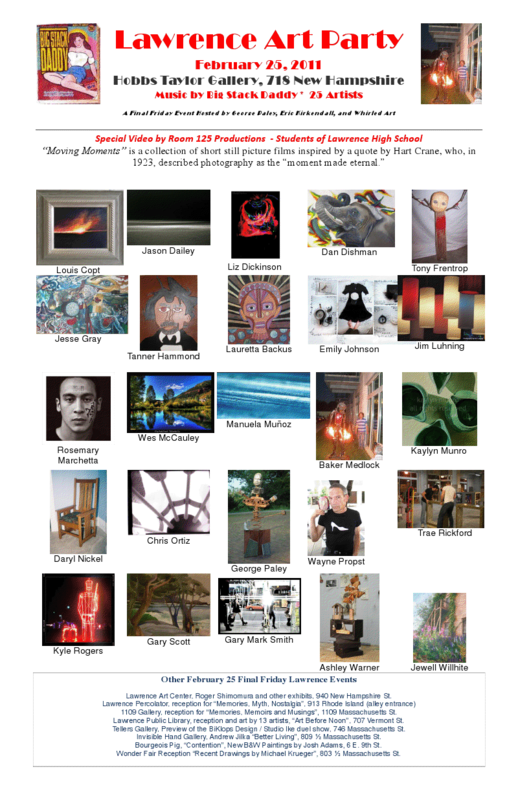 Closing reception – Saturday, March 19, 6-9 p.m. The Art of Roger Shimomura and His Collection of Art and Ephemera from the Japanese Internment Camps. This exhibit is a chance for the public to get a glimpse into “what’s coming” from Kansas artists and possibly to learn about each artist’s creative process. “These paintings examine the spatial and emotional relationships between facial features and expressions of multiple stacked portraits. Each work is an amalgamation of two or more images of one person. Thoughtfully positioned, the faces dissolve into one another. Their union develops subtle disturbances of clarity and coherence, while seeming to invent one creature of new feeling. Josh Adams was born and raised in Kansas City. At an early age he showed artistic interests and was encouraged by his parents to take piano lessons. The piano lessons later turned into drum lessons, which lasted until the end of high school. Josh also found solace in drawing as a means of expression, but never fully pursued the outlet until college. He attended the University of Kansas and graduated in 2006 with a BFA in painting and a minor in art history. Since graduating, Josh has exhibited his work locally in solo and group shows, toured the country playing music in various ensembles and moved to Los Angeles to seek a professional career in studio drumming-recording with Mike Andrews and Melanie Laurent. He currently lives in Lawrence where he works and makes art and music. Teller’s will be hosting the work of BiKlops Design and Studio Ike for a design-centric Final Fridays. Andrew Jilka’s “Better Living” is a show about the faults, failures, and aspirations that are pre-programmed into the notion of the American Dream. tedious repetition in drawings from the past ten months. “Q5Gallery” opens its doors for local artist to express their feelings about Governor Brownback’s new budget cut; abolishing the state’s arts commission, leaving Kansas to be the only state in the nation without this agency. Q5Gallery will be showcasing work by the gallery’s founding Artists and Fresh Produce Art Collective members. Along with a local Artist response to the budget cut we aim to inform and spark up conversation in the community regarding resent changes Brownback has made and other proposals involving budget cuts to the state. Exhibiting Artists: Local Artists Brownbacklash – Exhibition curator(s): David Lowenstein, Leo Hayden, Erok Johanssen, Bobbie Powell, Rachel Herring, Dan Dishman, Matt Farley, Paul Flinders, Jim Luhning, Phil Martinez, Jeromy Morris, Charles Ray, Matt Ridgway, Bill Scoular, Brent Teufel, and Josie Wrath. We’ll have 25 artists, live music, and a great time! Among the artists is one of Kansas’ most renowned artists, and winner of the Kansas Governor’s Arts Award, Louis Copt, who will be showing new works! New this month – a special exhibition by students from Lawrence High School, including video from Jeff Kuhr’s film/media class! Feb 21 – Movie at 1109 Gallery: “Herb & Dorothy” Vogel. This is about a couple, with very moderate means of support, who acquired over 4000 pieces Minimalist and Conceptual Art. The Spencer Art Museum has 50 pieces from their collection. Feb 25 – Open until 9pm for Final Friday Art Walks/Musicians, Snacks and Beverages. Lawrence Public Library, reception and art by 13 artists, “Art Before Noon”, 707 Vermont St. Final Fridays Lawrence on Facebook or FFLawrence on Twitter. and Final Fridays Calender of Events.